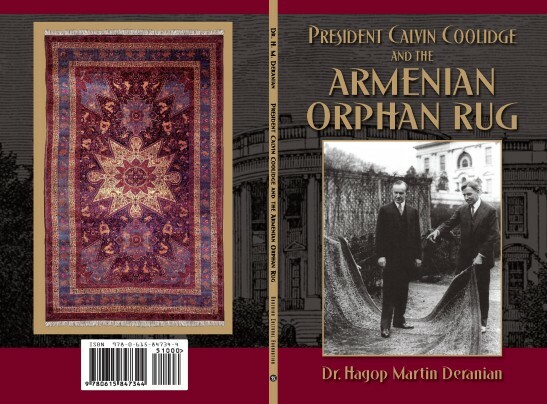 Cover art for “President Calvin Coolidge and the Armenian Orphan Rug” by Hagop Martin Deranian. The rug was woven by orphans in the 1920s and formally presented to the White House in 1925. A photograph shows President Calvin Coolidge standing on the carpet, which is no mere juvenile effort, but a complicated, richly detailed work that would hold its own even in the largest and most ceremonial rooms. 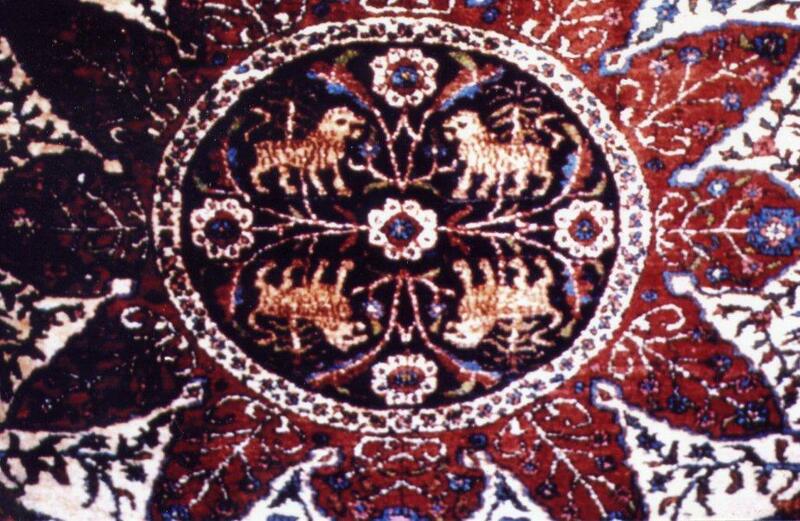 If you can read a carpet’s cues, the plants and animals depicted on the rug may represent the Garden of Eden, which is about as far removed as possible from the rug’s origins in the horrific events of 1915, when the fracturing and senescent Ottoman Empire began amurderous campaign against its Armenian population. Between 1 million and 1.5 million people were killed or died of starvation, and others were uprooted from their homes in what has been termed the first modern and systematic genocide. Many were left orphans, including the more than 100,000 children who were assisted by the U.S.-sponsored Near East Relief organization, which helped relocate and protect the girls who wove the “orphan rug.” It was made in the town of Ghazir, now in Lebanon, as thanks for the United States’ assistance during the genocide. There was hope that the carpet, which has been in storage for almost 20 years, might be displayed Dec. 16 as part of a Smithsonian event that would include a book launch for Hagop Martin Deranian’s “President Calvin Coolidge and the Armenian Orphan Rug.” But on Sept. 12, the Smithsonian scholar who helped organize the event canceled it, citing the White House’s decision not to loan the carpet. In a letter to two Armenian American organizations, Paul Michael Taylor, director of the institution’s Asian cultural history program, had no explanation for the White House’s refusal to allow the rug to be seen and said that efforts by the U.S. ambassador to Armenia, John A. Heffern, to intervene had also been unavailing. Although Taylor, Heffern and the White House curator, William G. Allman, had discussed during a January meeting the possibility of an event that might include the rug, it became clear that the rug wasn’t going to emerge from deep hiding. “This week I spoke again with the White House curator asking if there was any indication of when a loan might be possible again but he has none,” wrote Taylor in the letter. Efforts to contact Heffern through the embassy in the Armenian capital of Yerevan were unsuccessful, and the State Department referred all questions to the White House. 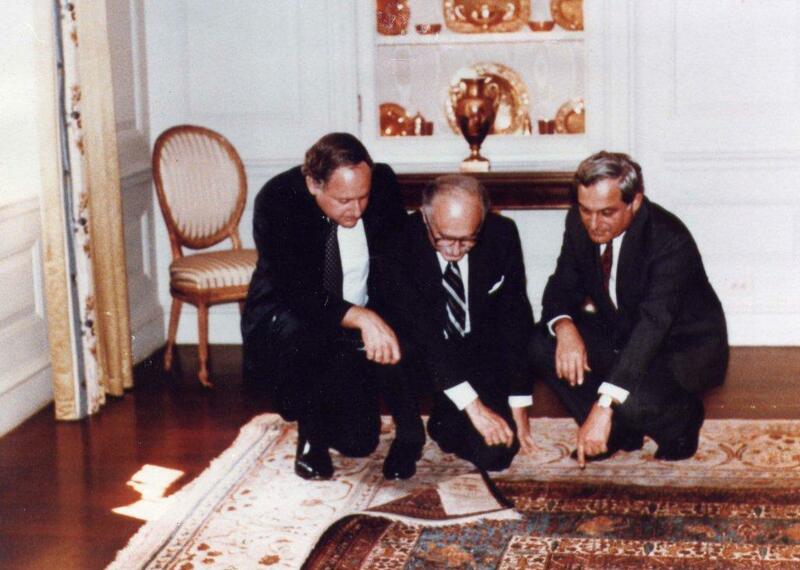 The Armenian Orphan Rug is viewed inside the White House in September 1984 by activists looking to preserve its identity. (L-R) U. S. Senator Carl Levin (D-Mich.), Dr. H. Martin Deranian, Worcester historian, and Set Momjian, a former ambassador to the United Nations. That leaves the rug, and the sponsors of the event, in limbo, a familiar place for Armenians. Neither Ara Ghazarians of the Armenian Cultural Foundation nor Levon Der Bedrossian of the Armenian Rugs Society can be sure if the event they had helped plan was canceled for the usual political reason: fear of negative reaction from Turkey, which has resolutely resisted labeling the events at the end of the Ottoman Empire a genocide. But both suspect it might have been. “Turkey is a very powerful country,” says Der Bedrossian, whose organization was planning to fund a reception for the event. And it’s a sign of the Obama administration’s dismal reputation in the Armenian American community that everyone assumes it must be yet another slap in the face for Armenians seeking to promote understanding of one of the darkest chapters in 20th-century history. Aram Suren Hamparian, executive director of the Armenian National Committee of America, says the president has had “a very negative reception across the board in the Armenian world, and that includes both Democrats and Republicans.” The principal emotion is profound disappointment. As a candidate, and senator, Obama spoke eloquently about the Armenian genocide, risking the ire of Turkey and Turkish organizations. But since taking office, says Hamparian, Obama has avoided the word, making more general statements about Armenian suffering. Critics of his silence point to the geopolitical importance of Turkey in a region made only more complex by the Arab Spring and a brutal civil war in Syria.The word genocide is a flash point in the ongoing animosity between Turkey, Armenia and the Armenian diaspora. Turkish resistance to accepting the historical facts of the Armenian genocide has included wholesale denial that the events took place, an effort to contextualize them as the fallout of a complicated, violent period, and semantic argument based on the 1948 legal definition of genocide, established by the United Nations. Independent scholars have eviscerated the first of these claims, demonstrated the bad faith of the second (the treatment of the Armenians was egregious) and grappled seriously with the legal particulars, especially the difficulty of proving the “intent to destroy, in whole or in part, a national, ethnical, racial or religious group, as such.” But few seriously argue that the events weren’t genocidal.Samantha Power, for example, uses the term “Armenian genocide” throughout her landmark 2002 book on genocide, “A Problem From Hell.” Power was appointed by Obama to serve as U.S. ambassador to the United Nations, and was confirmed in August. But the president’s language has been more circumspect. As a candidate, he said, “The Armenian genocide is not an allegation, a personal opinion or a point of view, but rather a widely documented fact supported by an overwhelming body of historical evidence. America deserves a leader who speaks truthfully about the Armenian genocide and responds forcefully to all genocides.” But in his most recent presidential proclamation honoring April 24’s Armenian Remembrance Day, he used the Armenian term “Meds Yeghern” — “great calamity” — while avoiding explicit mention of genocide. A close-up of the Armenian Orphan Rug with its intricate detail bearing colorful images of animals akin to the Garden of Eden. The rug was woven in 1924-25 and presented to President Calvin Coolidge. It now lies in storage inside the White House. In Power’s book, the author notes the power of “Turkish objections” to prevent official U.S. recognition of the genocide. As a presidential candidate, Obama said in a statement that he “stood with the Armenian American community in calling for Turkey’s acknowledgment of the Armenian Genocide.” But April’s presidential proclamation finessed the delicate situation by saying, “I have consistently stated my own view of what occurred in 1915, and my view has not changed,” suggesting he strongly supports a truth he no longer has the courage to utter. Calls and e-mails to the Turkish Embassy in Washington weren’t returned. The status of the rug remains ambiguous. It was last taken out of storage in 1995 and is reported to be in good condition. But a White House spokesman declined to answer questions about whether it might ever be seen again, if the climate is simply too politicized for the rug to be exhibited. And the Smithsonian is distancing itself from Taylor. “Dr. Taylor put this together on his own, nobody knew about it, certainly senior leadership didn’t know about it,” says Randall Kremer, who handles public affairs for the National Museum of Natural History, where Taylor is employed. Taylor says he doesn’t want to speculate about why the White House won’t lend the object, and he says he isn’t an expert on the tortured politics of the region. It was the rug, its iconography, its status among Armenians and its history that intrigued him, especially after hearing Armenians discuss it during a 2012 visit to Armenia. Although the White House can offer no explanation about why the rug is off limits to the American people, Der Bedrossian is optimistic that it might someday see the light of day. 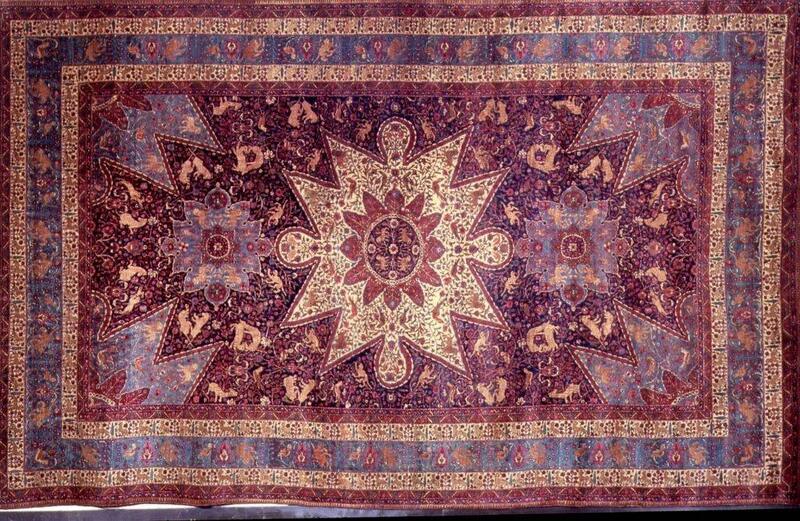 An overall view of the Armenian Orphan Rug, which measures 18’x12′. Armenian activists are trying to have it removed from storage inside the White House and have it showcased. Thank you for the tip. I’m happy to cover the subject! Thanks for stopping by. Reblogged this on Adventures with Anashe!.